The Women's Series Tour de Cure is the only female-focused Tour de Cure event in the country designed to celebrate YOU, and encourage women of all fitness levels to participate and join the fight to Stop Diabetes! Beginner cyclist? Don't worry! We will provide you with training rides, safety tips and the support you need to have a fun ride! Have a beach cruiser, hybrid or road bike? All are welcome! Register, Inspire others and Stop Diabetes! 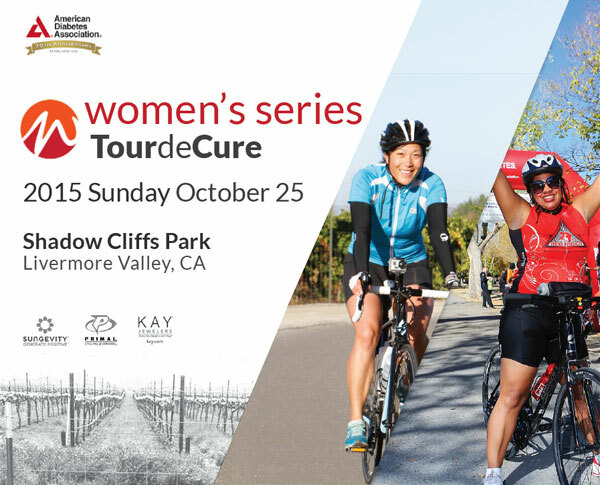 The Women’s Series Tour de Cure leaves no one behind! Choose from 12, 35 or 55 mile routes - ranging from a family-friendly ride along a bike path to a more challenging route through the beautiful landscapes and wineries of Livermore Valley. No matter which route you choose, it's all about women riding together, leaving no one behind. Our enthusiastic volunteers will support you along the way - on the road and at all well-stocked rest stops! At the finish line, the CHEERS will re-energize you, a catered LUNCH (with options for everyone) will refuel you, and free MASSAGES will rejuvenate you…just to start! If you're not a rider - you can still participate by supporting the American Diabetes Association Tour de Cure with a Tax Deductible Donation.